Kiscords baby safety locks are designed by a mom for moms. Many of our straps are assembled and packaged in the USA by people with disabilities. Other door fasteners may damage your cabinets! Ever thought about what could happen to your expensive furniture when you try to remove an adhesive from the doors after 2-3 years? Our latches keep small children safe, and offer the best protection and easy installation with no tools, screws or drill necessary. New parents with little one’s can rest easy that our ties will babyproof their house. After a few tugs on the strap, kids simply give up and leave the knob alone. 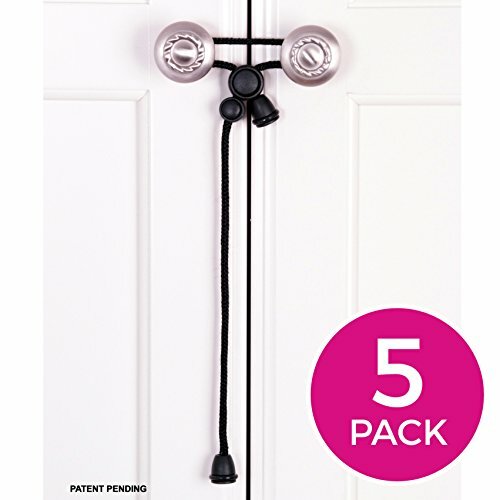 Our childproofing kit is also great for grandparents needing a temporary locking solution because they won’t scratch or damage kitchen and bathroom cabinets and they are very easy and effective to use. The cords can be removed using just one hand making getting into cupboards a snap. Our child proofing products are time tested and have consistently been a favorite for moms and dads for over 6 years. Unlike magnetic locks, our no drilling or adhesives childproof cord latches are portable and can go anywhere with on the go parents to secure cabinet knobs and keep your new baby out of danger. Our safety products also make for a great gift for a baby shower, birth announcement, or new baby present. New parents will be prepared when their infant begins crawling at 6 months old, the suggested time to baby-proof. Give our child proof safety latch a try and we guarantee you’ll love them or your money back. See our demonstration video at “Kiscords” on YouTube. THEY CAN FIT KNOBS UP TO 6 1/2 INCHES APART DEPENDING ON THE DIAMETER. THESE CORD LOCK CHILD CABINET LATCHES WORK ON KNOBS ONLY AND WILL NOT WORK ON A STRAIGHT CLOSED LOOP HANDLE. If you have handles, please see our other Kiscords safety fastener designed for that purpose. KEEP YOUR BABY SAFE FROM ACCIDENTS: This cabinet latch offers the best protection to keep your kids safe without damage to your expensive cupboards. Our cabinet latches are available in white and black colors to match any décor and are perfect for baby proofing kitchens, bathrooms and accessible furniture. NO DRILLING, NO ADHESIVE: Our cabinet straps are easy to install without drilling, screws, magnets or adhesives. They are the perfect solution to childproof your home without damaging your expensive doors and furniture. They easily adjust to secure knobs up to 6 ½ inches apart on center. Just what I needed… I agree with the rave reviews of this product. They work like a charm on side by side knobs, they are easy on the cabinets, and you hardly notice they are there. I love the suggestion another reviewer posted about throwing them in your suitcase to easily take and use on trips. Can use it with handles, not just knobs I’ll add some pictures to demonstrate, but you can use these locks with regular loop handles, not just knobs. Yay! Every cabinet in my house is now baby-proofed.